Lesson of the day – never, EVER, let anyone else navigate other than yourself! We got off to a good start. We knew there was a 4 to 5 hour climb at the end of the day, climbing to 959m, to the summit of Pirongia Mountain, and we were away from the Lodge just after 7am. It was going to be a big day. The pace was great along Old Mountain Road for the first 3km or so, then things got interesting. Having a quick look at my map along the road I see the trail leaves the road where the road switches back, enters into private farmland and follows a farm road south. Then my map got put away. Jurgen always has his GPS on. We got to the spot to enter into the farm and I started heading south on a farm road when Jurgen called from behind, “Mick, the trail goes this way.” Pointing to an orange marker heading out the west. “Are you sure?” “Yes. GPS. Trail goes this way.” There was a poled route with orange markers where Jurgen was pointing and we started heading to the west. Through paddocks we went for 3km until we hit a main road. This was not right. There are no major roads that cross the trail for at least a day. I could hear heavy traffic as we approached the road. This was definitely not right. At the road I pulled out my GPS and consulted the map. I put us out to the north, 2.7km off trail. What went wrong? Just about all trails in NZ are marked with the same orange markers and we had taken a wrong turn following a different walkway. Under the surface I was seething, swearing and cursing in my head. But I had no one to blame but my self. I should have paid better attention to my own navigation and been confident in my decision in heading along the farm track that I started down. For over 800km I had not had a geographical embarrassment, and for the first time relying on someone to point the way, we loose the trail as soon as we are off the road. “Sorry. Mick. Sorry.” No ones fault. Mistakes happen. I was angry but Jurgen kept saying “What can we do?” He was right. All we could do was back track and get back on route. There was no alternative and being angry about it was no going to change the situation. We still had to walk the distance. And we walked back. I walked hard, almost at a trot at times. Time and distance were important to me today. While I don’t have a set time frame for Te Araroa. I basically had enough food to get me to Waitomo in a few days and that was it. I needed to get up to Patautea Hut tonight and not spend an additional day out. We arrived back at the trail junction and it was fairly obvious where we had gone wrong. Time for a break before commencing the actual route for the day, still some 23km to go. At least it was the perfect sort of day for hard walking. Coolish, but warm when walking, and without the blazing sun to contend with, and it wasn’t raining. And so the trail passed along a series of farm tracks and a few paddocks for the next 4km. The trail was up high and offered fantastic views out across the Piorngia Mountain Range with the ridge line we were to climb on clear display. The views made up for the extra kilometres. It was then into a forest section for 3km with nice trail. Heading down hill was tough on the knees though. I don’t know how people walk this trail without poles. Hitting the road I was determined to walk fast the last 3km of road walk to a picnic area to have some lunch before picking up the Kaniwhaniwhai track and onto the Tahuanui trail. I flew down the road. There was very little conversation happening. I was hungry and focused on making a lunch spot at a decent time to ensure there was enough time to reach the hut. Our lunch spot was great, by a river and in the shade. I had a really quick lunch today, about 20min, enhailing a couple of wraps and some chocolate and filling my water with hydration powder. Now it was onto the big climb for 5 hours or so over 7.5km. The track to Kaniwhaiwha was awesome. Flat, gravelled and wide for 3km, basically a vehicle track close to traffic. Easy to follow. 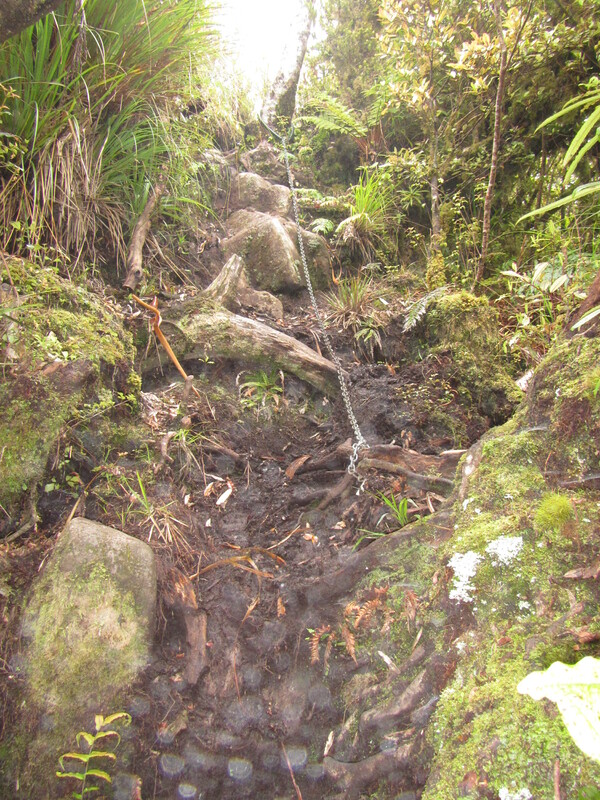 The start of the Tahuanui Track was perfect as well, at least for the first 4.5km km. Well graded, a bit of mud but nothing major and very few roots. Then it got interesting. The final 3km is where the trail kicks up steeply, the mud starts and the roots. The climb was arduous and took every bit of time. I don’t recall too much detail or anything of note on the way up as I was fully focused on just putting one foot in front of the other to get to the top. Continual thick mud for mud of the way reminded me of Tassie. One thing I still don’t understand is the NZ geography. How can a climb up through a valley be devoid of muddy sections and yet all the ridge lines retain the water and pool pockets of mud? Shouldn’t water flow down hill? This ridge line basically took at long to climb as it does to drive from home to Melbourne – puts a different perspective on things. 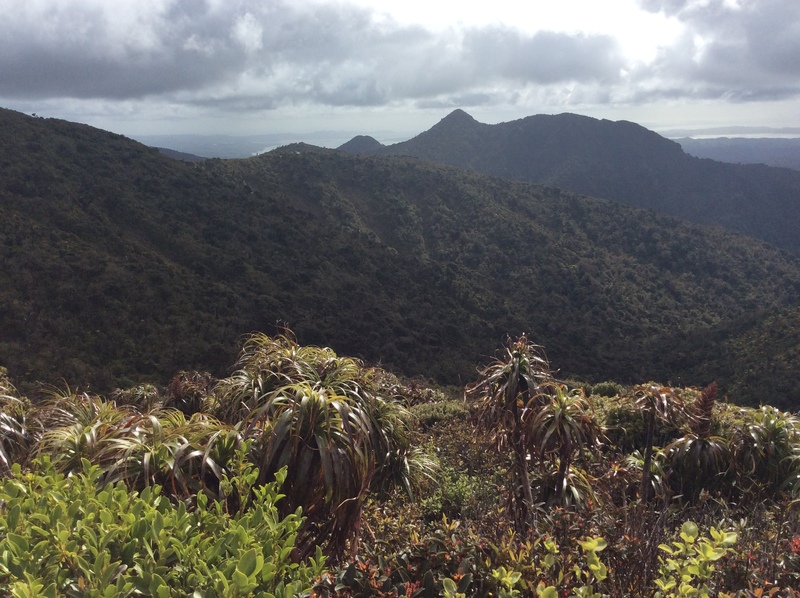 After what seemed like a time I reached the summit of Pirongia and let out an almighty – wohoo!! Climbing the small tower on the summit to get a view above the trees I got off a few quick pics across the 360 degree view. It would be amazing on a clear day. Unfortunately the cloud was starting to roll in. And the wind was picking up. Nothing for it now other than to walk the remaining 1km to the hut. I was hoping there would be room in the hut and we didn’t have to tent it. It was mid week and the weather wasn’t the best. Fingers crossed. On approach to the hut all looked quiet. Then I sighted them. The first pair of shoes out the front, then another, and another. Over a dozen pairs of shoes out the front. I wasn’t sure how big the hut was. Arriving on verandah and peering in through the window a large group of year 12’s on holidays plus a few other trampers out for an over nighter. But there was room. Great. Straight into the hut I threw the kettle on, had a cup of tea and made dinner. Jurgen arrived around a half hour later. It will be an early night for me. Hope the kids don’t party too hard.